Preheat oven to 375 degrees F (190 degrees C). Position rack in center of oven. 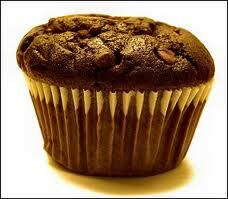 Butter, or line with paper liners, 12 - 2 3/4 x 1 1/2 inch muffin cups. In a large measuring cup or bowl whisk together the eggs, buttermilk, and vanilla extract. In another large bowl whisk together the flour, cocoa powder, sugar, baking powder, baking soda, and salt. Stir in the chocolate chips. With a rubber spatula fold the wet ingredients, along with the melted butter, into the dry ingredients and stir only until the ingredients are combined. Do not over mix the batter or tough muffins will result. Evenly fill the muffin cups with the batter (the muffin cups will be full), using two spoons or an ice cream scoop. Place in the oven and bake until a toothpick inserted in the center of a muffin comes out clean, about 20 minutes. Transfer to a wire rack and let cool for about 5 minutes before removing from pan. In the bowl of your electric mixer, or with a hand mixer, beat the butter until smooth and creamy (about 1 minute). Add the sugar and beat until it is light and fluffy (about 2 minutes). Beat in the vanilla extract. Add the chocolate and beat on low speed until incorporated. Increase the speed to medium-high and beat until frosting is smooth and glossy (about 2 -3 minutes). Spread a little frosting on each muffin with a knife or offset spatula. Makes 12 - 14 regular sized muffins.